Thomas Tucker Hanson and his twin brother Henry were born November 10, 1907 in the Navesink section of Middletown. A tremendous all-around athlete, he was a muscular 6’1” as a two-sport star for Leonardo High. He followed his older brother, Joseph, onto the varsity as a seventh grader and was the school’s star half back in 8th grade. The boy nicknamed “Swede” drew large crowds to his football and baseball games in the 1920s. Leonardo ran a Notre Dame-style offense under coach Gyp Blood and by Swede’s junior year he had mastered it. That 1925 season Swede’s junior year began with a 95-yard return of the opening kickoff and a 194-yard rushing performance against Freehold. It ended eight games later with a state championship. Leonardo repeated in 1926, outscoring opponents 231–20 and earning another state title. The highlight of the year was a 40–0 drubbing of Rahway High, which had been considered the top team in New Jersey. Swede was also the star of Leonardo’s basketball and baseball teams, leading the diamond squad to a state championship. His home runs were the stuff of legend. Swede enrolled at Temple University in 1927 and continued to make headlines as a college football player. He could run, pass, kick and tackle as well as anyone on the field. As a freshman in 1927, he scored 29 points in a historic 110–0 shutout of Blue Ridge, and finished with 80 in the season. As a senior in 1930, he led the Owls to a 7–6 upset over Bucknell and its star back Clark Hinkle. Swede scored the winning touchdown on a long punt return and ran down Hinkle late in the game with a spectacular tackle. Swede was honored as an All-American after the season. He also was featured in a Ripley’s Believe It or Not cartoon for having punted a ball completely out of Temple’s football stadium. After graduation, Swede signed to play with the NFL’s Brooklyn Dodgers. The team was terrible, losing 12 of their 14 games in 1931, He joined the Staten Island Stapletons in 1932, and suffered through another two-win season. The team went belly-up and the players were awarded to the NFL’s new franchise in Philadelphia, the Eagles. Swede wore #14 for the Eagles. Four decades later another Jersey Boy, quarterback Pete Liske, would wear the same number for Philly. 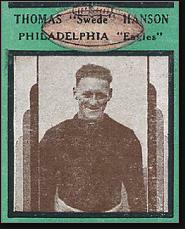 Swede was thrilled to be “home.” He scored the franchise’s first touchdown and over the next four seasons became the club’s most exciting player, leading the Eagles in rushing from 1933 to 1936. He was an All-Pro fullback in 1933 and 1934, and led the NFL in rushing attempts in 1934. Swede gained 805 yards on the ground that year, at the time one of the highest totals in league history. He was also a game-breaking threat as a receiver and a solid pass-defender. Swede was traded to the Pittsburgh Pirates in 1938. They would be renamed the Steelers in 1940. By then, Swede was out of football and working as a mechanic in the Philadelphia Naval Shipyard. He labored there until he passed away in 1970 at the age of 62. At the time of his death, another New Jersey athlete named Swede Hanson was a famous wrestler.